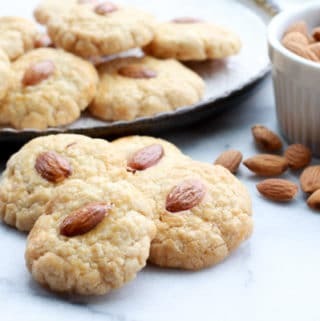 Last Updated: April 15, 2019 · Published: April 15, 2019 By: Asian Caucasian 12 Comments This post may contain affiliate links or sponsored content. What inspires you when you get in the kitchen? For me, I get inspiration from great chefs and the places I’ve eaten. This dish was definitely inspired by a recent visit to one of my fave local restaurants, Drift Fish House & Oyster Bar. 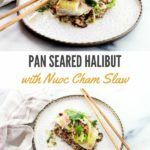 My hubby and I didn’t want the special of the day so we asked it they could mix things up and they created a similar version to this recipe post: Pan Seared Halibut with Nuoc Cham Slaw. Of course, I had to run home and immediately recreate this with my own Asian spin. 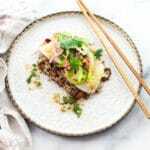 Flaky pan seared halibut is nestled on top of tri-color quinoa (from Trader Joe’s) with shiitake mushrooms and topped with a tangy, spicy slaw with Nuoc Cham dressing for an impressive, healthy dish! 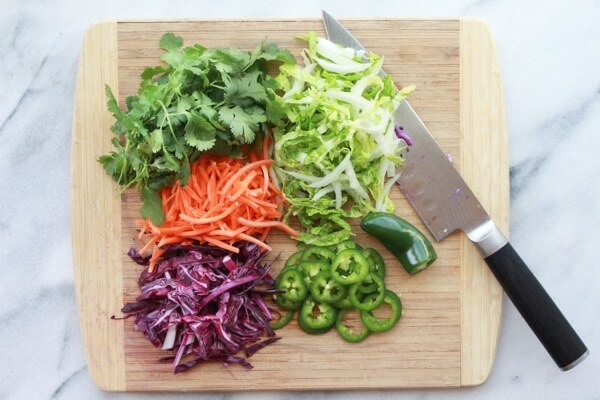 This Asian slaw is so easy to whip together and has lots of crunchiness from the shredded cabbage, matchstick carrots, and spicy jalapeños! In a large mixing bowl, toss together the cabbages, pickled onion, sliced jalapeños, and cilantro. Mix together with the Nuoc Cham dressing until thoroughly coated. In a medium glass mixing bowl, whisk together the olive oil, fish sauce, lime zest, lime juice, sambal oelek, cilantro, mint, shallots, garlic, sugar and salt. Taste for seasoning (ie, add more salt). Store in the refrigerator for up to three weeks or freeze for up to six months. 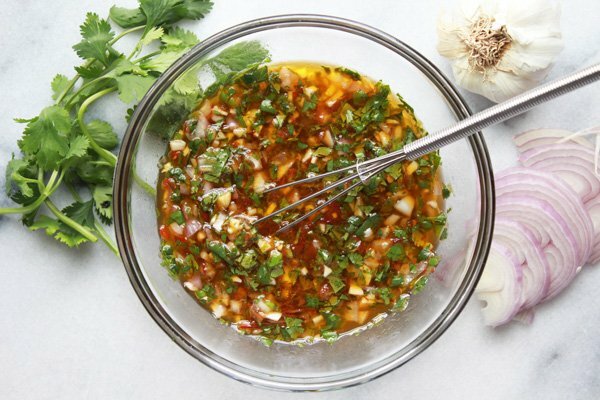 Nuoc Cham also makes a great dipping sauce for Asian dishes! Bring the halibut to room temperature. Pat the surface of the fish with paper towels to dry thoroughly. Season each side with salt and pepper. I highly recommend using a heavy skillet or cast iron pan to sear the halibut. I can’t tell you what a difference it makes. You’ll want to get the oil smoking in the pan before you add the fish. DO NOT flip the fish until it loosens on its own. It should be golden brown when you flip it. This recipe may look like it has a ton of ingredients, but you can make the nuoc cham ahead of time, as well as the pickled onions. 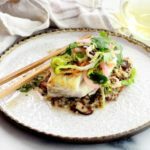 The halibut cooks up quickly, so this impressive dish could be on your dinner table in less than 30 minutes! WANT MORE? If you like this recipe, you’re going to love my seared salmon recipe that I make in my cast iron pan, Asian Rubbed Salmon. 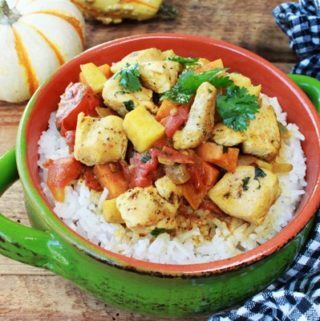 It’s loaded with so much flavor from the spices and is so damn good! You’ve put all of my favorite flavors into that dressing and with the halibut this must have been a delicious meal. 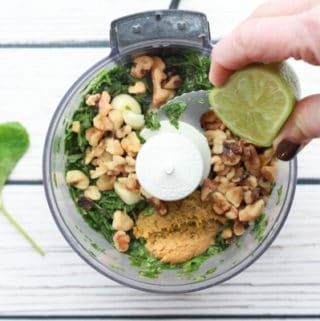 I will definitely be trying out that dressing! 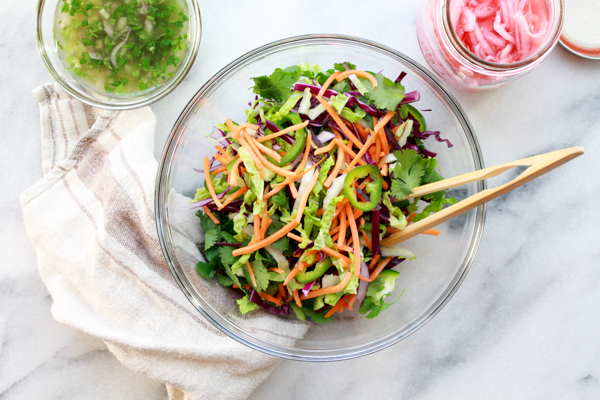 That Nuoc Cham dressing is incredible, but not just in this Asian slaw. 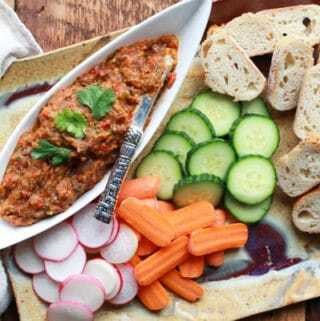 I use it as a dipping sauce for so many dishes! You’re going to love the flavors! I adore halibut! Can’t wait to try this! It is fun when you get inspiration from a delicious meal you ate! Yes it is! I try to find new restaurants all the time so there will always be some form of inspiration to recreate a dish! 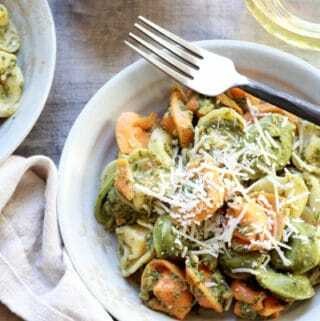 I so love this recipe and all the ingredients. I first had halibut in Spain by chance as the restaurant did run out of sea bass and recommended halibut instead. 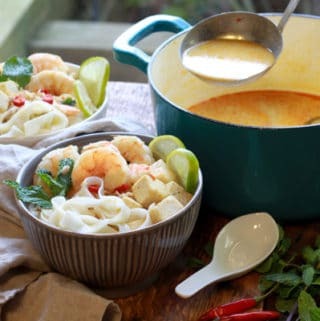 I always like to try new things but when it comes to fish I am not that adventurous as I have had some bad experiences. Wow, I was so happy I did go with their recommendation, it was stunning. I always buy it since. 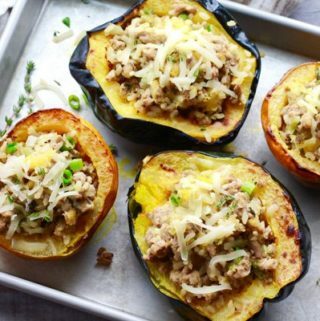 This recipe is a ‘must make very soon’ one! Love all the flavours and ingredients! Saved! Thank you so much! I love halibut as well, but I adore most flaky white fish like sea bass, cod, etc. I love that halibut is such a sturdy fish and that it won’t fall apart on you. Yet it maintains that flaky texture. 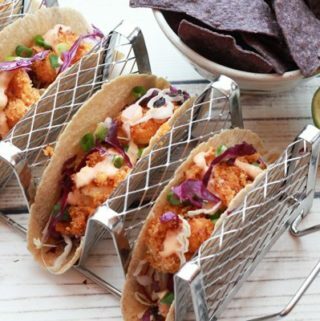 Hope you enjoy this recipe as much as we did! This is a stunning dish! In fact, when I saw the photo I thought this is 5 star restaurant food! That nuoc cham slaw sounds fabulous. Have to try it! Thanks for the very kind compliment! I had this plating in mind as I was cooking it. 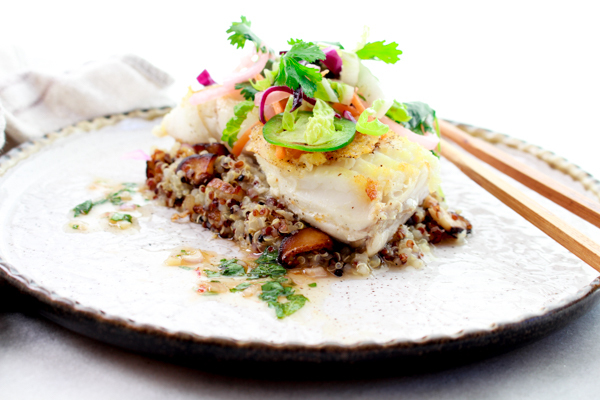 It just needed texture on top of the halibut and the Asian slaw seemed like the perfect balance. I’ve been eating this slaw with the Nuoc Cham dressing alone as a salad. Sooo good! When I tell people where lots of my inspiration comes from people often laugh at me 😉 I honestly read restaurant menus online, restaurants from all over the world! 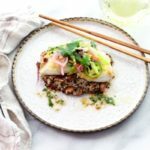 I love all of the flavours you have got going on with this classically cooked fish, it sounds heavenly! Thanks so much, Brian! Inspiration can come from just about anywhere! I read a lot of food magazines also. Great ideas! 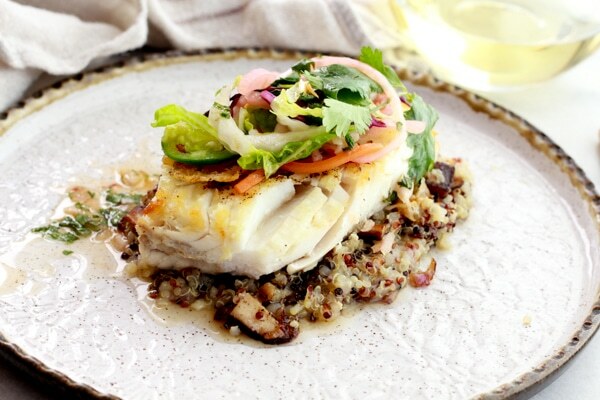 Halibut is one of my favorite fish to prepare because it’s so sturdy. 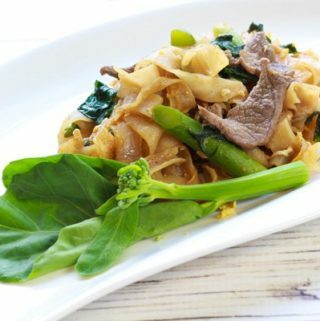 This dish is a real winner! Love all of the flavors going on! Thank you, Carol! I cannot tell you how good this tasted! My hubby was begging for more! I really love to cook with halibut also, for the same reasons. Plus, it’s so flaky and mild.